Happy 41st Birthday Earth Day! Recycle and Reuse… that’s the deal to minimize your carbon footprint. In all facets of life-including backyard birding, there so many recycled products from which to choose. Recycled plastic finch feeders, and every other kind of feeder and birdhouse seriously help to keep plastics out of our landfills. A recycled bluebird feeder I purchased a few years ago came with a sticker saying how many plastic jugs were used to make this item. It wasn’t a “stock” sticker either, because the number 33 was hand written on it. Besides that… the feeder still looks brand new after three years! These new recycled finch feeders are pretty cool too as they feature “all-over” feeding space. Unlike traditional tube feeders that have perches, these finch feeders have something called “magnet mesh” which is very attractive to clinging birds such as finches. 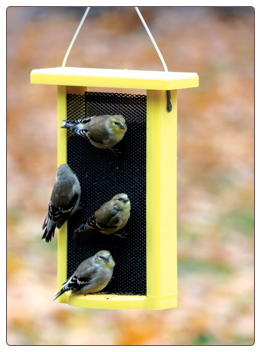 Consider making your next finch feeder, oriole feeder, bluebird or woodpecker feeder a recycled plastic one. The non-porous surface is easier to clean and minimizes mold and bacterial growth. They won’t warp, crack, split or fade, and it’s likely the feeder (or house) will still look new after several years of use. Recycled is a wise investment and saves money in the long run because the product lasts! Hold your nuts in all kinds of peanut bird feeders! Attract many kinds of birds… and squirrels too if you don’t add a baffle to peanut bird feeders! Wood Peckers, Nuthatches and Blue Jays especially love whole peanuts in the shell, and there are so many cool ways to offer up this wild bird delicacy. There are lots of peanut bird feeders available for shelled peanuts too if you’d rather not contend with the ground waste, and birds like them equally as well. 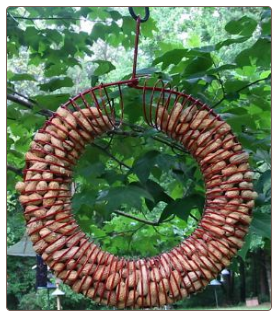 The wreath feeder shown here makes a fun peanut feeder, fruit feeder, or even a nesting material container in spring. A plain old suet cage or basket is a great way to offer peanuts. These cages, whether double, single, inexpensive, or quality recycled plastic make perfect peanut bird feeders. 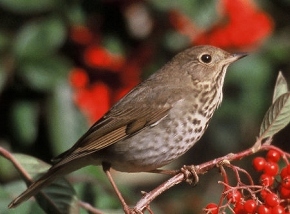 They’re terrific for offering nesting materials in spring, and work wonderfully for serving fruit in summer to attract migratory birds. Now that’s versatility! 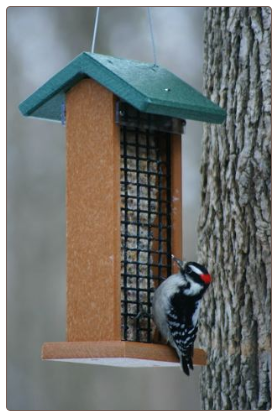 Even if you don’t feed suet to your birds, the cage-like design makes them perfect for year round use. 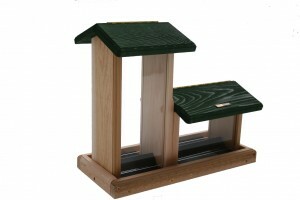 In fact, this recycled plastic double suet feeder is actually deemed a three-in-one feeder-for suet, peanuts, or fruit. 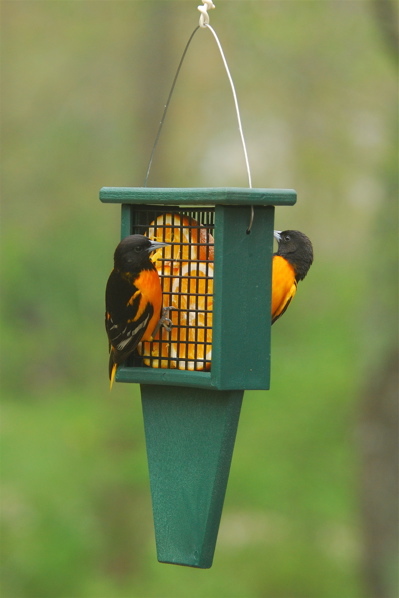 This suet feeder has Orioles chowing down on oranges in summer, but you can attract a wide variety of feathered friends year round with suet feeders used for peanuts, nesting material, and oh yeah… suet too! Ever Seen a Double Decker Hopper Bird Feeder? Some bird feeders hold more seed than others, while some feeders just look better in the yard. There are some large capacity wild bird feeders that really do look good! You can spend less time filling, and more time watching when using hopper style feeders. They tend to have a larger capacity than tube feeders, and many will compliment your environment too. 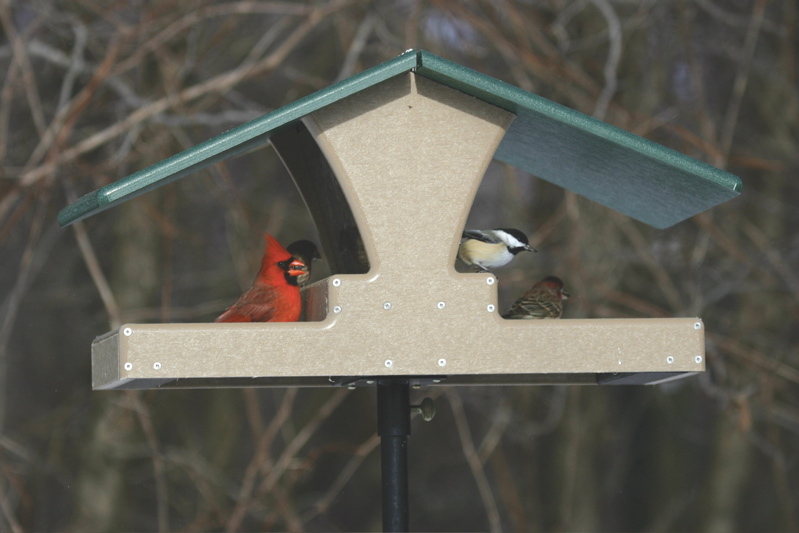 This recycled feeder is a “Double Decker Hopper” and allows more perching room than a traditional hopper bird feeder. The bottom, or base also acts as a seed catcher to prevent unwanted ground mess. This type of feeder will attract a greater variety of wild birds, while the recycled plastic is guaranteed to never crack, split or fade. With a 4-quart capacity, you won’t have to make as many trips filling the feeder. Have You Tried Recycled Wild Bird Feeders? They’re guaranteed to never crack, split, or fade! If you could purchase something that came with a manufacturer’s guarantee, wouldn’t you trust it? 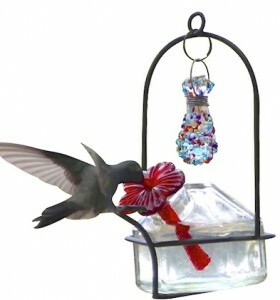 Recycled wild bird feeders are probably one of the greatest advancements in backyard birding products. Made from milk jugs and other recycled plastics, they greatly reduce landfill waste, and are some of the most durable feeders on the market! The Log Bird Feeder above uses 10 milk jugs for it’s production, while the Fly-Thru Feeder uses about 32 milk jugs each! Most recycled feeders are guaranteed to never crack, split or fade. Attractive as well, they’re available in every style from hoppers, to platforms and fly-thrus, and even log feeders for feeding suet to woodpeckers and others. Recycle and Reuse! Backyard birding is a wonderful hobby, that for some like me, turns into an obsession! Too many feeders, too many bird baths to fill and clean all the time. Keeping bird feeders filled can get expensive, especially when using premium foods. Every birdfeeder is equipped with a squirrel baffle…I’ve learned the hard way! When warmer weather approaches and it’s time to put out hummingbird feeders, I know it will only cost pennies to create the nectar hummingbirds adore. Last season I did a test with commercial red nectar and plain old sugar water…the sugar water mix won! 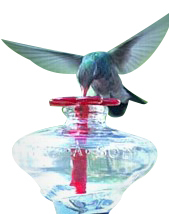 One hummingbird feeder was filled with red nectar, while the other had the home made version. Three times as many hummingbirds went for the sugar water. It convinced me immediately to make my own nectar . The recipe: 1 cup table sugar to 4 parts water. Could it be any easier? No need to boil the water (bacteria is spread through the birds’ bills at the feeders) but in doing so it dissolves the sugar quicker. I use 1 cup of boiling water until sugar is completely dissolved, then add 3 cups of cold water. There is no cooling time and nectar is ready to go in feeders! If you do decide to try the recipe, NEVER add anything else to the mixture as it will harm, or even kill hummingbirds. Reuse and Recycle with eco-friendly wild bird accessories. Recycled glass has become very popular in the last few years. 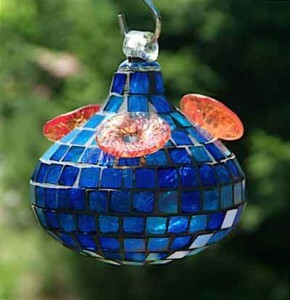 Even hummingbird feeders are available in this eco-friendly art glass. These feeders are high quality, and functional design for any environment. The choices are amazing….you don’t have to use a red plastic version anymore! The myth of the red feeder is really just a myth. Tiny jewels know if the feeder has nectar in it for them…not sure how, but they know! With the vibrant hues and creative designs, hummingbird feeders make lasting, and excellent gift choices for the nature lover on your list. Commercial nectar is ok for hummingbirds, but we’ve found that plain old sugar actually works best to attract more hummers. Simple Nectar Recipe: 1 cup sugar to 4 cups water…nothing else in the mix as it will harm hummingbirds. 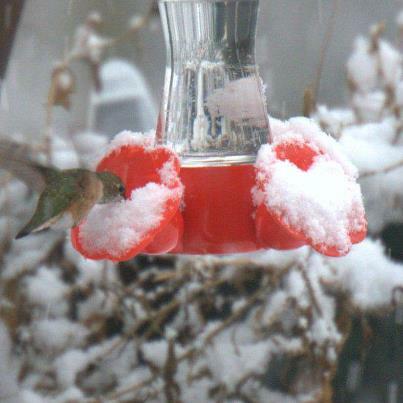 You don’t have to boil the water–bacteria is spread through the bills of the hummingbirds at the feeders. Boiling water makes for quicker and easier dissolving of sugar. We boil 1 cup water, mix the sugar and add 3 cups cold water. The nectar is ready with no cooling time. Store unused portion in the fridge for up to 2 weeks. Happy Birding! Backyard birding certainly entails some chores! Attracting wild birds requires some effort with filling feeders, maintaining houses, and keeping birdbaths clean. If you enjoy feeding wild birds, but sometimes get tired with the frequency of filling feeders…fret no more! Large capacity bird feeders are the answer. In general, a hopper bird feeder will hold more seed, they’re desgned to do just that. You can spend less time filling and more time watching with a large capacity feeder. This double hopper feeder holds 7 quarts of sunflower or mixed seed. They’re even available in recycled materials, and built to last a lifetime. By investing in a few quality bird accessories, you’ll ultimately enhance your bird watching experiences.